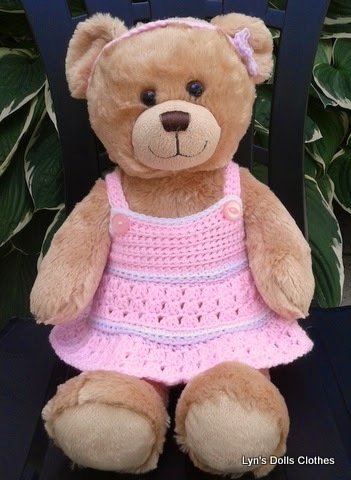 Another crochet dress for your bears worked in double crochet rows for the bodice and treble crochet clusters for the skirt. 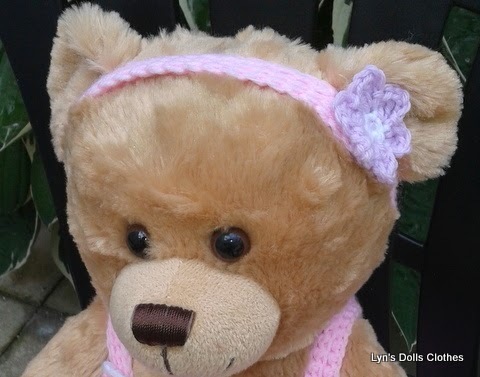 The pattern is in two sizes to fit most bears from 12" to 17". All bears are different and this pattern is so easy to adjust to fit - if you want to make the skirt longer just work an extra round of clusters or add a few more dc to the bodice to increase the width. This is build a bear Li'l Cub wearing the smaller size. Actual measurements: 1st size: chest 14", length from shoulder to hem 8.5"
2nd size: chest 17", length from shoulder to hem 10"
When working the clusters, work through both loops. When working double crochet rows work in the front loop only and make one chain at beginning of row as an edge stitch - do not count this in stitch count. Using no 4.00 hook and contrast, work a round of dc around top edge of bodice. Sew straps in place at back of bodice keeping in line with armholes. 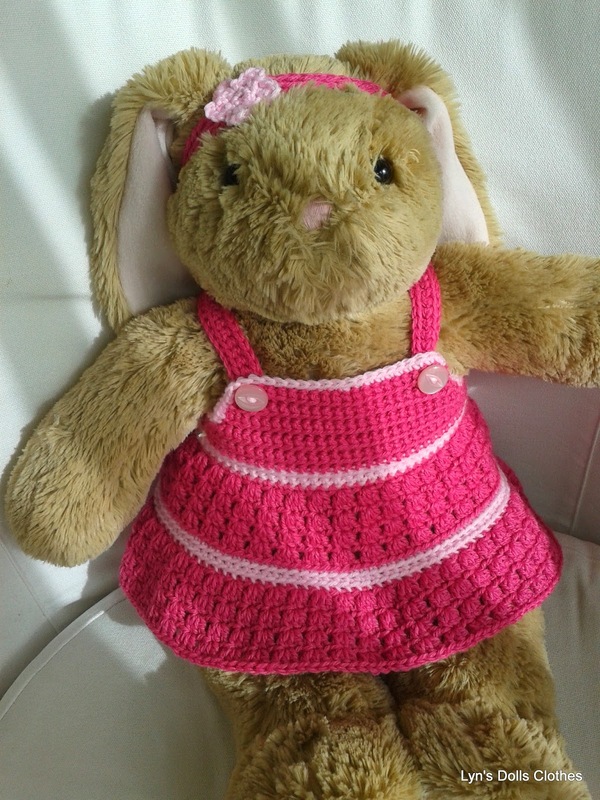 Check length of straps over your bear’s shoulder, to ensure a good fit, then sew on buttons. Pull yarn through and fasten off. I just finished two dresses. Thank you so much!!! Happy Crocheting. happy you like the pattern. If you're on Ravelry I would love to see a photo.